RATIONALE: Best practice is an abstract word open to different interpretations. The definition of best practice depends on the context. PURPOSE: The purpose is to explore the meaning of the concept of best practice within the context of intrapartum care. METHOD: The concept of best practice was analysed using Wilson's method of concept analysis. Dictionaries, a thesaurus, and an internet search were employed. References of journals were used to identify extra sources. Data saturation was reached at 117 definitions and uses of the concept of best practice. The definitions and uses of the concept of best practice listed in column one were read repeatedly. Common and similar patterns of words were highlighted. Grouping of common attributes and connotations occurred in column two and further deductive analysis and synthesis occurred in column three where derived essential attributes of the concept of best practice were categorised. RESULTS: Three broad categories emerged, namely (1) Values as antecedents of best practice; (2) A three-phased interactive integrative cyclic process of best practice; (phase one: awareness; phase two: need analysis and interactive process; phase three: consolidation); and (3) Desired outcomes of best practice, with resultant theoretical definition of the concept best practice during intra-partum care. Theoretical validity was attained through 117 sources used. The concept of best practice has been in use since the late 19th and the 20th century (Friedman et al., 2007). Best practice is a concept that originates from Taylor'swork (1911: 22) on the "one method and one implement that is quicker and better than the rest". Since then a growing body of knowledge has emerged to define best practice and to quantify its value to an organisation. This has become a worldwide language in a post-modern society used by professionals, such as midwives working in the birth units (Axson, 2010). Literature is devoid of the best practice definition or clarification as a concept within the intrapartum care context hence the need for concept analysis (Katz, Rangel-Eudave, Allen-Leigh, & Lazcano-Ponce, 2008; Williams, 2006). The analysis of a concept is the first step towards building the foundation of a nursing theory. The outcome of concept analysis is a set of defining characteristics on what counts as a concept. Furthermore, concept analysis allows the researcher to formulate a theoretical and operational definition of the concept under study. In addition, it allows the researcher to develop or choose a measuring instrument that accurately reflects the defining characteristics of a concept measured and to identify the concept when it occurs in a clinical practice (Walker & Avant, 2005). Duncan, Cloutier, and Bailey (2007) alluded to the existence of various methods of concept analysis such as Walker and Avant (2005) and Wilson (1963). Furthermore Duncan et al. (2007) a assert that even though the existing methods have differences they do have some similarities and use language interchangeably to describe a number of processes such as the steps followed to analyse a concept. Wilson's method (1963) is regarded as a classical and traditional method of concept analysis. This method of concept analysis has been used by other researchers such as Chabeli and Muller (2004), Thompson (2005) and Matutina (2010), and is therefore selected by the researcher as a method to analyse the concept of best practice. Several international and national best practice initiatives exist such as WHO/UNFPA/UNICEF and AMDD (2009) and the National Department of Health (2015). Unsafe intrapartum care practices continue to occur despite the availability of best practice initiatives. Having practised as a midwife and currently being a midwifery lecturer, the researcher observed that some of the midwives are still using routine intrapartum care interventions not supported by evidence-based practices. Such interventions are more likely to cause harm to women during childbirth, such as the use of fundal pressure to shorten the second stage of labour and the Valsalva manoeuvre. The need for clarification of the meaning of best practice within the intrapartum care context is a necessary for the midwifery professionals or profession. The objective of this paper is to explore and elucidate the meaning of best practice and to provide a conceptual framework. Best practice is defined as a means of systematically building on effective approaches to any given issue by examining existing experiences and processes that work. Understanding such existing experiences and processes in the light of agreed values, expert opinion and best available evidence and extracting from them lessons learnt that can be applied in the context of different social, economic and cultural settings (ILO, 2003). Intrapartum care refers to the period from the commencement of true labour throughout the first, second, third and the fourth stage of labour, which last from one to two hours after delivery of placenta (Lowdermilk, Perry, Cashion & Alden, 2012). Concept analysis "is a process of operationalising a phenomenon so that it can be used for theory development and/or research measurement" (Duncan et al., 2007, p. 295). Baldwin (2008) explored the concept analysis method as a method of enquiry. Wilson's method (1963), used by the researcher, departs from an ontological ideal that is closer to a naturalistic inquiry epistemology and a relativist context-bound ontology (Duncan et al., 2007). The researcher used eight out of eleven steps as outlined by Wilson. The omitted steps are numbers five, six and seven because ordinary experiences during the intrapartum period in steps three and four provide sufficient instances to clarify what is and what is not the concept of best practice during intrapartum care (Wilson, 1963). The following steps are described below. It is important to isolate the questions of the concept from other concepts before attempting concept analysis. Questions on the concept ofbestpractice thatmaybe asked are whatthe logical meaning is and what is the nature of best practice during intrapartum care? The questions require factual knowledge on what characterise best practice and its importance and worth during intrapartum care (Wilson, 1963). Finding the right answers involved the exploration of primary and secondary sources about the uses of the concept of best practice revealed the differences among and within the various disciplines such as Business, Education, Nursing, Law and Medicine. Multiple data sources used academic databases, such as Ebscohost and PubMed. Dictionaries, books, CD roms and Google were also used. From the sources consulted, the researcher identified 117 definitions and uses of the concept of best practice. The subsequent two paragraphs describe the procedure that was followed to analyse the concept of best practice. Analysis of data acquired followed theoretical saturation. A table of three columns was used with 117 definitions and uses of the concept of best practice listed in the first column. The definitions and uses of the concept of best practice were read repeatedly while highlighting clusters of phenomena related closely to one another through deductive analysis. The second column listed the identified combined clusters of attributes. In column three, further deductive analysis, inductive analysis and synthesis occurred and the reduced clustered attributes were listed under the three broad categories, namely antecedents, process and outcome (Walker & Avant, 2005). Table 1 illustrates the antecedents, process and outcomes of the concept of best practice. Wilson (1963) recommends developing examples (cases) to place a concept in a situation within a specific context. A model case is a situation occurring in clinical practice consisting of essential features or examples of the concept under study (Table 2). 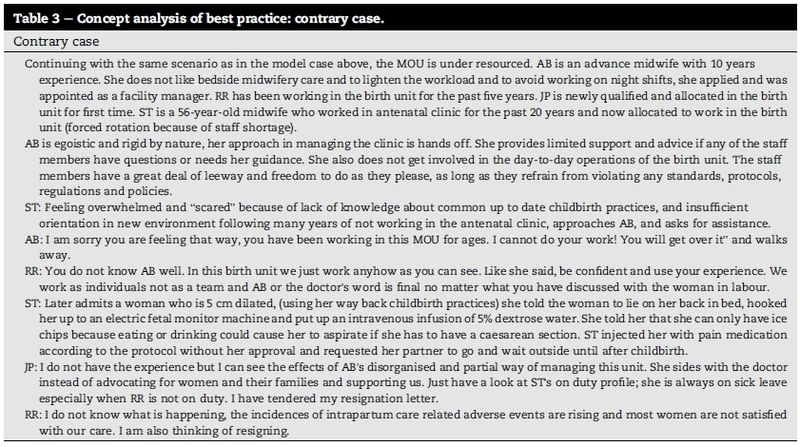 The constructed contrary case illustrates a situation within the intrapartum care context that included some of the attributes that gave a contradictory picture of the concept being analysed (Table 3). During the process of analysing the concept of best practice, firstly it became clear that the concept is used in different contexts, which endorses the importance of analysing best practice as a concept within the intrapartum care environment. Secondly, the use of the concept of best practice varies and is preceded by values as antecedents. Lastly, in some instances certain essential attributes of best practice are more obvious and nearer to the core of the concept than others (Wilson, 1963). The researcher identified the essential attributes of the concept of best practice in relation to intrapartum care. Fig. 1 is a concept map illustrating the antecedents, process and outcome of best practice. The underlying anxiety consists of a feeling of uncertainty when one is sure about something up to a certain stage and then all of a sudden one is no longer certain about something (Wilson, 1963). The midwives' underlying anxiety arose because of their concern about the status of the birth unit in aspiring to provide best practice during the intrapartum period. The question of what works or what does not work during intrapartum care triggered the underlying anxiety of the midwives. In as much as conceptual questions answer the underlying anxiety of the meaning of best practice, questions should also have practical results (Wilson, 1963). An analysis of the concept of best practice resulted in the identification of attributes that clarified the concept of best practice to give direction to the empirical phase. In addition, the descriptions of the operational definition of best practice in the context of intra-partum care. The essential attributes describing the theoretical definition of the concept of best practice emanated from the analysis of the concept (Wilson, 1963). The findings of concept analysis of best practice provided the framework for the second objective of the research. The findings of concept analysis of best practice revealed three categories, namely: the antecedents that are the prerequisite of best practice, process of best practice and the outcome of best practice and their related connotations. The results are described in accordance with Table 1. The antecedents of best practice are values, which are crucial for best practice to prevail during intrapartum care. Values influence practitioners' actions and are vital to socialisation and the resultant development of professional identity (Stacey, Johnston, Stickley, & Diamond, 2011). The values identified on analysis of the concept of best practice are respect, trust, justice, open-mindedness, set of beliefs, traits, ethics, systematic organisation, motivation, flexibility, continuity, consistency, commitment, integrity, discipline and responsibility. Respect is not only a core and fundamental value in the practice of the nursing and midwifery profession, but is also a mutual and reciprocal phenomenon in all human life situations. Midwives should not try to control women; they should rather help them to function in response with their body rhythms. As a result the intrapartum care environment should be peaceful and respect childbirth as a normal physiological process (Halldorsdottir & Karlsdottir, 2011). Women's experience of disrespectful and dehumanising intrapartum care will negatively affect their trusting relationship with midwives. Caring during the intrapartum period is the core of professionalism in midwifery as a service entrusted by the community to midwives. Therefore, midwives are obliged to establish a relationship of trust with women and treat them as individuals (Halldorsdottir & Karlsdottir, 2011). A lack of mutual trust between the woman and the midwife is detrimental to the caring relationship necessary for best practice during the intrapartum period. In such a situation, women are more likely not to trust midwives and may experience the care as unjust. Justice is one of the core virtues of intrapartum care (Sellman, 2003). To render a just intrapartum care, midwives should be competent and base their care on evidence that is more likely to benefit the individual needs of women. Best intrapartum care will not occur if midwives are not fair and open to women's point of view of how they should be taken care of? An open-minded midwife is able and willing to form an opinion, or revise it, in the light of available evidence and argument in order to promote best practice during intra-partum care (Sellman, 2003). The fixed implementation of a protocol to address the specific problem experienced by a woman during the intrapartum period is inappropriate. Flexibility is another value that emerged and the definition by Larsson, Sahlsten, Sjöström, Lindencrona, and Plos (2007) suggests the adoption of a flexible approach to intrapartum care to allow best practice to prevail. Flexibility is also inherent in the midwifery care belief system. The International Confederation of Midwives (ICM) (2005) believes that a nurse/midwife offers care based on a set of beliefs. Furthermore, the ICM described a set of beliefs for midwives, such as the belief that birth is a normal physiological process and midwife's presence with woman during childbirth. Consequently, for best practice to occur, midwives should uphold various sets of beliefs and traits to render woman-centred care regardless of the birth setting. Traits are a collection of distinctive, enduring aspects of an individual's personality, reflecting a pattern of interpersonal relationships and adaptation to the environment, such as friendliness, orderliness and punctuality (Freshwater & Maslin-Prothero, 2005). Such traits are essential for best practice to occur. Intrapartum care is a physically and emotionally demanding undertaking requiring midwives to possess traits that promote a high level of functioning to render the best intrapartum care. Ethics is about doing what is good and avoiding harm, which is what is needed for best practice during intrapartum care? Halldorsdottir and Karlsdottir (2011) suggest that a code of ethics enables professional self-regulation. Midwives face ethical issues of greater or lesser significance during intra-partum care and may be judged on the basis of justness, correctness and reasonableness in a manner that is systematic and organised. A systematic organisation during the intrapartum period ensures continuity of care and patient safety (Haggerty, Roberge, Freeman, & Beaulieu, 2013). Midwives make use of various processes, such as the nursing and management processes, in a well-coordinated manner during intrapartum care. A birth unit that is well organised and functions systematically contributes to midwives' improved morale and motivation, leading to the provision of best intrapartum care practices and women satisfaction. Motivation is powered by emotions that improve in the presence of innovative workplace practices directed by a visionary leader of the childbirth unit in this instance (Cristini, 2011). Motivated midwives enhance the organisation's achievement and maintenance of best intrapartum care service. Haggerty et al. (2013) define continuity as the degree to which a series of discrete intrapartum care events are experienced as coherent, connected and consistent with the women's needs. Midwives sharing the same traits and attributes of caring throughout the stages of childbirth, contribute to consistency during intrapartum care. Consistency is a trademark of wisdom that enables mid-wives' intrapartum care practices to be experienced as linked and well articulated by women (Haggerty et al., 2013). Consistency is enhanced by commitment to the implementation of policies related to intrapartum care and the use of a moral framework, especially when dealing with issues of ethical dilemma. Management practices within the birth unit should focus on the active involvement and empowerment of midwives to promote ownership and commitment (Cristini, 2011). Mid-wives' commitment to remain devoted and truthful is crucial to best practice during the intrapartum period. Ethical behaviour builds trust that is sustained by integrity with subsequent professional and organisational growth, success and excellence. Midwives have their own personal and professional integrity which is necessary to facilitate best practice during intrapartum care (Tyreman, 2011). Likewise, midwives without integrity will detract from best practice during the intrapartum period and bring the organisation into disrepute. A midwife with integrity will portray discipline. Organisational policies, employment conditions, a professional code of conduct and scope of practice ensure that midwives remain disciplined in terms of their behaviour and the manner in which they discharge their responsibilities (Scrivener, Hand, & Hooper, 2011). Responsibility is equated to the duty to provide care no matter whether the task is minor or complex. Nonetheless, in each case there is an opportunity for harm to occur (Scrivener et al., 2011). Midwives take responsibility of the care they provide and make appropriate decisions in situations of clinical complexity and uncertainty. Described values complement one another as crucial characteristics needed in a midwife in order to be able to render best practice to women during intrapartum care. A process is the series of actions through which a phenomenon is attained. The best practice process consists of three phases as represented in Fig. 1. 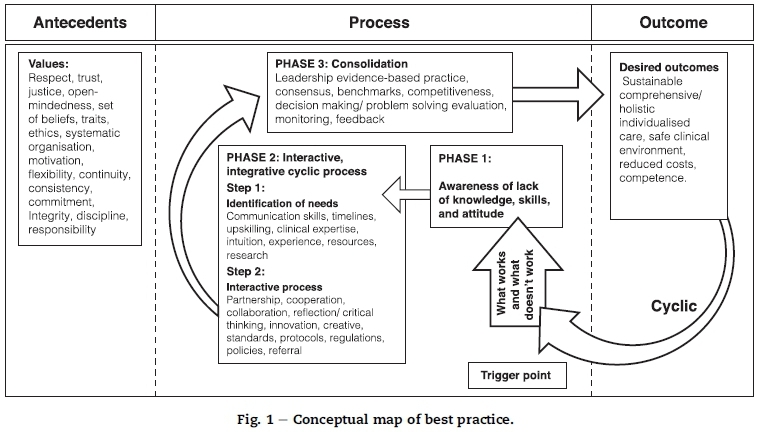 The results of the concept analysis revealed that the process to attain best practice in a birth unit is an interactive, integrative and cyclic process. The process of best practice begins with an awareness phase triggered by what works and what does not work, identification of needs, and an interactive process, and ends with a consolidation phase to strengthen the process of best practice during intrapartum care. The awareness phase is triggered by the question of what actually works and what does not work anymore in the birth unit. What work needs to be expanded and strengthened and what work does not need to be reviewed.Reinhardt, Mletzko, Sloep, and Drachsler (2012) assert that awareness has an impact on the individual method of operation and triggers reflection in order to look at issues, interventions and supplies from a different perspective. Midwives' self-awareness of being without or having insufficient knowledge, capacity and attitude, results in the mobilisation of others to search for and identify exactly where gaps exist. The results of concept analysis revealed that the intervention needed to facilitate best practice should be interactive, inte-grative and cyclic in nature.Facilitation of best practice requires a cooperative, collaborative and concerted effort by all stakeholders. Furthermore, a combination of capabilities and resources using a nonlinear series of actions to achieve best intrapartum care as depicted in Fig. 1, is also needed. Mid-wives should provide mechanisms to sustain continuous, interactive and integrated care activities with other health care professionals. They should also optimise participation in clinical decision-making and problem solving within and across disciplines. An awareness of the need for critical analysis of personal practice is essential in order to identify the need for acquisition of the knowledge, skills and attitude required to engage in cyclic, interactive processes to facilitate best practice during intrapartum care (Reinhardt et al., 2012). The concept analysis results indicated that the process of facilitating best practice during intrapartum care requires need analysis and an interactive process. The attributes identified under need analysis are communication skills, timelines, upskilling, clinical expertise, intuition, experience, resources and research. The childbirth environment should support open communication in order for women and their families to feel free to verbalise their thoughts and wishes (Olsson & Adolfsson, 2011). Good communication skills is one of the defining features of a midwife who is sensitive and meets the set timelines in acquisition of essential resources to render the best intrapartum care. Timelines enforce discipline. Midwives' adherence to timelines in reporting, procurement and the completion of tasks is an essential component of effective management of the unit and efficient intrapartum care. The availability of supportive infrastructure to track agreed upon timelines is also essential (Crozier, Moore, & Kite, 2012). Midwifery care is dynamic and evolving, and failure by midwives to keep up with new developments is deleterious. Upskilling clinical programmes, such as essential steps to manage obstetric emergencies, should be made available to midwives (McHugh & Lake, 2010). Upskilling of midwives brings about clinical expertise. Years of experience and level of education contribute to expertise at the proficient and expert levels (McHugh & Lake, 2010). Prolonged placement in a birth unit enables midwives to advance the necessary experience related to intrapartum care that is essential for the development of clinical expertise. An expert midwife is competent in terms of knowledge, skills and attitude, has a vast background of experience, intuition, and acts intelligently in different situations. McHugh and Lake (2010) define clinical expertise as that aspect which, together with experience and continued education, enables midwives to develop the sixth sense that is crucial for the best intrapartum care. Competent, expert and experienced midwives use their intuitive knowledge appropriately during emergencies related to intrapartum care. Midwives make intuitive judgements in predicting the impending risk during intrapartum care and act accordingly, using available resources to prevent adverse outcomes (Olsson & Adolfsson, 2011). Resources include people, finance, equipment, time, expertise and information (National Department of Health, 2011). Adequate staffing, sufficient supplies, instruments, and working equipment, as well as infrastructure are necessary to ensure the uninterrupted delivery of best intrapartum care. Best intrapartum care requires knowledge of current research, as well as a critical analysis of own practices to come up with best practice initiatives tailored to meet the individual needs of women and their families. As a result, Crozier et al. (2012) alleges that midwives should be capacitated to undertake research in their clinical areas. Satisfaction of the identified needs lead to an interactive process of best practice. The interactive process requires partnership, cooperation, collaboration, reflection/critical thinking, innovation, creativity, standards, protocols, regulations, policies and referral. Inter- and intra-organisational partnerships are realised through entering into formal relationships based on shared goals, common purpose and shared decision-making (Casey, 2008). Cooperation is working together harmoniously towards a shared goal (Hastie & Fahy, 2011). Intrapartum care is a shared encounter, midwives and obstetricians work side by side and may need to consult and or refer women to other members of the health team. As a result, inter-professional cooperation and collaboration is vital for the interactive process of best practice during intrapartum care. Reflective practice is a buzzword for best practice. Mid-wives should engage in constant evaluation through critical reflection of their own practice in order to address the gaps so that intrapartum care may be improved (Halldorsdottir & Karlsdottir, 2011). Midwives' ability to reflect enables rational clinical reasoning and judgement, leading to safe clinical decisions and the problem solving necessary for best practice during intrapartum care. Critical thinking is the core cross-field learning outcome of all educational programmes in South Africa. The development of critical thinking will enable learners to solve problems analytically in their specific learning areas, such as nursing and midwifery (Chabeli, 2006). A midwife's critical thinking skills are needed for making safe and efficient clinical decisions. A critical thinking midwife is more likely to be creative in the care of women and their families during the childbirth period. According to Baron and Tang (2011) creativity is the starting point of innovation. Midwives who are capacitated with research skills are able to develop their own evidence base using their clinical expertise leading to creative and innovative thinking (Crozier et al., 2012). However, midwives' creative and innovative strategies for best intrapartum care should be in line with the standards, protocols, regulations and policies of the birth unit. Standards, protocols, regulations and policies enable and support midwives' practice during the intrapartum period and are formulated collaboratively and accepted through expert consensus. Once formulated, standards, protocols, regulations and policies should be reviewed periodically (Ilott, Rick, Patterson, Turgoose, & Lacey, 2006). Various standards exist regarding midwives' practice, education and training (National Department of Health, 2011). Protocol refers an agreed upon statement about a specific clinical issue, with a precise sequence of activities to be adhered to (Ilott et al. 2006) When using protocols, midwives should not blindly follow step by step, but rather apply their minds to align protocol to the individual needs of the women during intrapartum care. Amidst the prevailing circumstances within the birth unit environment and the imposed role extension, midwives should always act within the confines of their scope of practice. Policies, such as basic intrapartum care (National Department of Health, 2015) facilitate, amongst others, the implementation of current research and evidence-based practice (EBP) by midwives. Where there is a need midwives apply a referral policy to refer women who present with problems beyond their capabilities to another level of care. Referral guidelines and routes are necessary to support midwives to provide continuity of care for women and families experiencing complexity during birth (Ilott et al., 2006). Consultation with other health professionals is central to best practice during intrapartum period. The purpose of consolidation is to strengthen the process of facilitating best practice during intrapartum care. Consolidation is done according to agreed-upon guidelines and timeframes. The process involves the integration of activities to enable an organisation to achieve effective and efficient operations (Colgate & Jones, 2007). 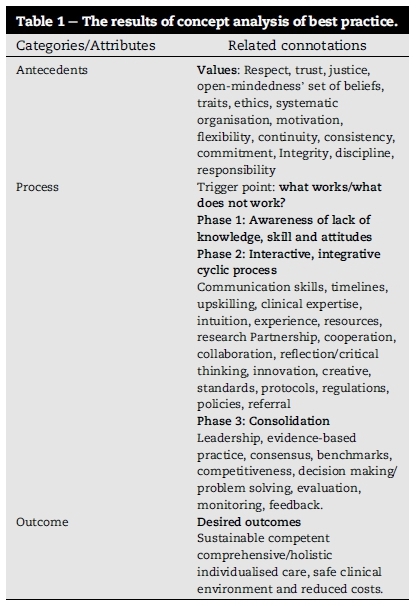 Leadership, EBP, consensus, benchmarks, competitiveness, decision making/problem solving, evaluation, monitoring and feedback as depicted in Fig. 1 arose as vital to the consolidation of the process of best practice. The midwife as a leader should be able to apply leadership skills in all aspects of work in order to achieve organisational goals within the constraints of scarce resources (National Department of Health, 2011). A midwife as a unit manager uses evidence-based knowledge to lead in a positive and encouraging manner to motivate staff members to be committed to best intrapartum care practices. EBP is the conscientious, explicit and judicious use of current best evidence in making decisions about the care of individual women (Ilott et al., 2006). The consensus approach is used to generate ideas, understand problems and to agree on complex, multiparty issues such as problems related to intrapartum care practice (McCance, Telford, Wilson, MacLeod, & Dowd, 2011). Consensus is essential for best practice during intrapartum care. Midwives should also serve as panel members in consensus meetings on the formulation of intrapartum care guidelines and benchmark tools to monitor implementation and adherence to best practice during intrapartum care. Khare, Saxsena, and Teewari (2012) defines benchmark as a standard that is aspired by observing a best practice Benchmarking of best intrapartum care practices can occur within the birth unit and between highly recognised birth units nationally and internationally. However, benchmarking also creates equal competition opportunity for like institutions. Competitiveness forces midwives working in the birth unit to use creative and innovative processes to improve the standards of care and service delivery (Khare et al., 2012). This implies that creative and innovative decision-making and problem solving strategies sustain organisational competitiveness. Decision-making and problem solving are core intra-partum care competencies required from midwives. Decision-making and problem solving cannot occur without expertise in professional judgement. Moreover, practitioners need to refine the other sources of influence by retaining relevant and valuable information based on the best available evidence, client values and contextual factors (Chabeli, 2006). Evaluation is an important aspect in strengthening the process of best practice in a results-oriented environment. It provides feedback on the efficiency and effectiveness of performance, as well as identification of gaps related to intra-partum care within the birth unit (Chabeli, 2006). The best practice process includes constant monitoring of the practice to see whether the practice yields the best results. Regular monitoring of the indicators alerts managers to areas in which advances have been made and those that need strengthening (WHO/UNFPA/UNICEF & AMDD, 2009). Midwives should participate in establishing a systematic process for monitoring, which includes feedback mechanisms and indicators to measure performance and compliance to best practice during intrapartum care. Feedback on performance and compliance facilitates reflection and self-assessment, which leads to self-directed learning (Chabeli, 2006). Mid-wives working in the birth unit need to continue learning from feedback results and need to continue improving intrapartum care practices leading to positive outcomes. The results of the concept analysis revealed that the desired outcomes of the best practice process are sustainable, comprehensive/holistic individualised care, a safe clinical environment, reduced costs and competence. Sustainability of initiatives as a desired outcome of best practice process requires, amongst others, interdisciplinary workforce commitment and local and international partnerships. Best intrapartum care practice initiatives that are sustainable lead to comprehensive, holistic and individualised care in a safe environment (National Department of Health, 2011). The belief is that the use of the nursing process enables midwives to render comprehensive, holistic, individualised and scientific intrapartum care. Soanes and Stevenson (2008) define comprehensive as including or dealing with all or nearly all aspects of something. Holistic nursing care embraces the mind, body and spirit of the patient, in a culture that supports a therapeutic nurse-patient relationship, resulting in wholeness, harmony and healing (McEvoy & Duffy, 2008). Midwives' provision of individualised care recognises the uniqueness of the individual woman's needs and the importance of providing best intrapartum care tailored to meet individual needs (Halldorsdottir & Karlsdottir, 2011). Such intrapartum care contributes to a safe clinical environment. A safe clinical environment includes the clinical setting, equipment, staff, patients, nurse mentors and the avoidance, prevention as well as amelioration of adverse outcomes or injuries stemming from the process of health care (Halldorsdottir & Karlsdottir, 2011). Provision of best intra-partum care service by a competent midwife in a well-supported birth environment reduces costs. There is a need to consider the methods of managing costs because of health care that is becoming more financially demanding (McKenna, Keeney, & Hasson, 2008). Maintaining resources, resolving practice related gaps and midwives' behavioural issues and incompetency contribute to cost reduction which is the desired outcome of the best practice process. 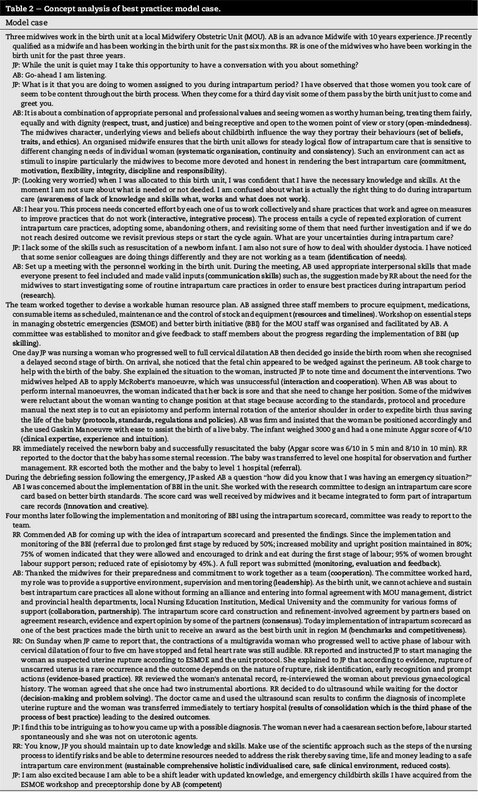 Halldorsdottir and Karlsdottir (2011) alluded to professional competence and professional wisdom among the other competencies that midwives should possess in order to render the best intrapartum care. The competent midwife should be foresighted and able to respond appropriately to both planned and unanticipated situations in order to ensure the safety of the women and their families. From the concept analysis, the attributes and connotations that underpin and form the boundaries within which best practice occur during intrapartum care were defined and described. The following represents a theoretical definition of best practice. Best practice during intrapartum care is a value-driven, interactive and integrative cyclic process that leads to safe, sustainable, comprehensive and individualised care by a competent midwife. Theoretical validity is a central part demonstrating the worth of the concept analysis. The exploration and description of 117 definitions and uses of best practice from literature, following theoretical saturation, ensured theoretical validity. Literature used to support the description of the results of concept analysis. The results of the analysis of the concept of best practice have implications for midwifery practice, research and education. The limitation is that only a theoretical concept analysis of best practice was done without empirical verification from the midwives to obtain additional data to further expand or clarify the concept. The recommendations are that the results emanating from the concept analysis of best practice be used for research and didactic activities, such as the development of an instrument or assessment tool, or the development of a model or programme. The concept of best practice was analysed using Wilson's method of concept analysis (eight selected steps). The results of the concept of best practice were deductively analysed, synthesised and attributes categorised in terms of Walker and Avant (2005). The attributes of best practice, theoretical definition and theoretical validity were described and discussed. The results that emerged provide a framework to explore midwives' perceptions of how best practice can be facilitated during intrapartum care. E-mail addresses: marychabeli7@gmail.com (M.M. Chabeli), jackiem@uj.ac.za (J.M.L. Malesela), agwnolte@uj.ac.za (A.G.W. Nolte). Peer review under responsibility of Johannesburg University.